Estadio General Pablo Rojas, also known as La Olla Monumental, is Paraguay’s largest stadium, just beating Estadio Defensores del Chaco in terms of capacity. For the first 65 years of its existence, Cerro Porteno played at various grounds across Asuncion until in 1959 club president Pablo Rojas announced plans to construct an entire new stadium. For this, land was acquired next to Cerro’s home ground back then, Estadio Adriano Irala. Estadio General Pablo Rojas opened on 24 May 1970. 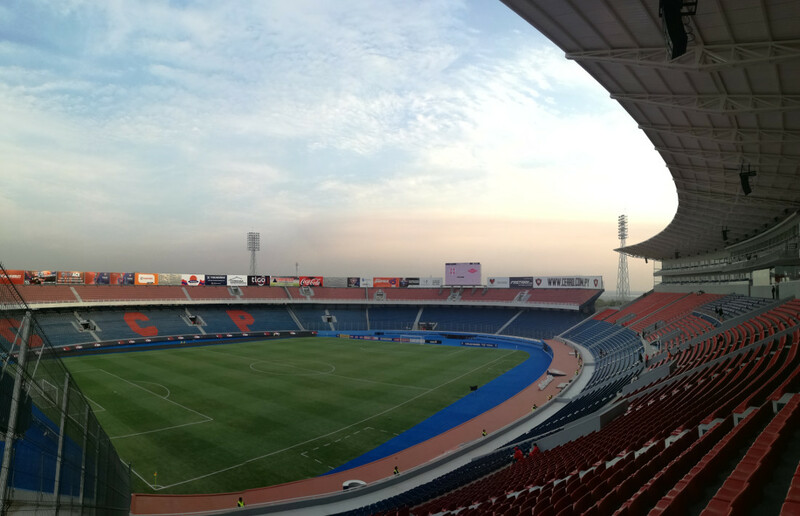 In 1999, the stadium hosted one first round group match during the 1999 Copa America that was held in Paraguay. Over the years, one corner of the stadium remained open, which got filled up with a stand in 2009. In 2015, the club presented plans for a large redevelopment of Estadio General Pablo Rojas, which included the demolition of the old Estadio Adriano Irala, making place for a new north stand, the construction of a second tier on the eastern and southern stands, as well as a reconstruction of the main stand with additional hospitality seats. Works started in 2016 and were completed in September 2017. Estadio General Pablo Rojas is located in central Asuncion just over 2 kilometres south of Asunción’s city centre. It lies about 8 kilometres from the upscale Carmelitas area, which boasts lots of entertainment, in the north-east of the city. The walk from the centre takes just under half an hour though it may be easier to take a taxi. From most other areas of Asuncion take a taxi or enquire locally about suitable bus routes. The stadium lies just under 6 kilometres north-west from Asuncion’s central bus terminal (Terminal de Omnibus), which lies in the south-east of the city. Take a taxi or enquire about appropriate buses. Tickets for Cerro Porteno games can be bought through any of the sales outlets of the Red UTS network, or at Cerro Porteno’s club office, located next to Estadio General Pablo Rojas, in the days before the match. Sales outlets include various in Asuncion’s city centre (mostly at the Aqui Pago points at various shops) as well as across the city in shopping centres like Shopping del Sol, Paseo La Galeria, Shopping Mariscal, Shopping Multiplaza, or at the Punto Farma pharmacy near the bus terminal. Tickets can also be bought at the stadium on the day of the match. Expect to pay from Gs. 20,000 for a seat at one of the curves to Gs. 40,000 for a seat at one of the sides. VIP tickets cost Gs. 100,000. Tickets can be more expensive if bought on the day of the match. Cerro.com.py – Official website of Cerro Porteño.